❶ When it comes to the party or celebration,the responsibility for a host is heavy and evident,such as hours clean-up at the end of the even which will always makes you exhausted and drive you crazy. ♥ That are why we designed the disposable aluminum foil pans for you which can save you from those terrible things due to its' advantages of Convenience,Superior Heat Distribution. - Made from 100% FOOD-GRADE RECYCLABLE aluminum foil, they are incredibly STURDY and SAFE,ensuring that THEY WILL UPHOLD BACKING AND RETAIN ORIGINAL TASTE AND FLAVOR OF FOODS. - They get the job done and there is NO CLEANUP REQUIRED,just threw away once finished,MAKING THE CLEANUP A BREEZE,so why not get a chance to relax yourself ?! Top Out Length - 12.4"
Top Out Width - 8.5"
Top IN Length - 11.4"
Top IN Width - 7.5"
Please do not hesitate to contact us if you are not satisfied with our product,we will try our best to offer you a satisfactory solution. [ DIMENSIONS ]: Aluminum foil pan top outer measures 8.5*12.4 inches, top inner measures 11.4*7.5 inches; depth is 1.77 inches; 2.35L capacity, 0.5 inches curl rims provide sturdy grip for easy handling. 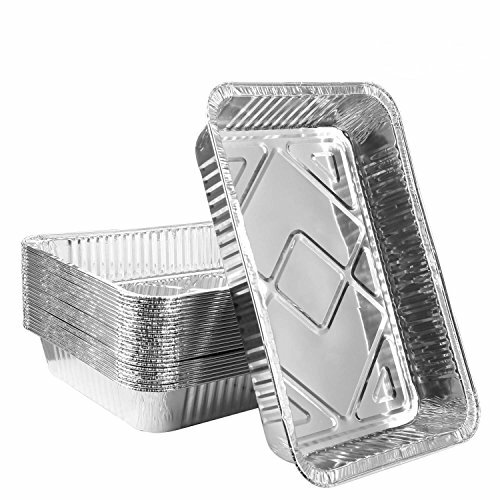 [ QUANTITY ]: Each pack includes 24pcs aluminum foil pans,a ideal pack for you to serve varieties of foods whatever in large group party or in daily use.Package do not come with lids. If you have any questions about this product by fohuas, contact us by completing and submitting the form below. If you are looking for a specif part number, please include it with your message.